A Single Scoop That Measures From 1/8 tsp. Up To 2 Tbsp. A space saving kitchen gadget that will make traditional measuring spoons obsolete. The NuScup Mini (pronounced new scoop) from Dalla Piazza is a revolutionary tool that makes measuring wet and dry ingredients fast, easy, convenient and less messy. It is the companion to the larger size NuScup. This single scoop allows you to simply select the amount you need to measure from 1/8 tsp. to 2 tbsp. The patented mechanism makes this adjustable measuring spoon extremely effective and easy to use. It will provide years of smooth easy operation. Simply slide the rubber thumb knob to the desired position and scoop away. Thanks to high quality materials and craftsmanship the NuScup Mini works equally well for both dry and wet ingredients. Ergonomic, one-handed operation makes it perfect for elderly or physically challenged people. It is virtually unbreakable and stain resistant. This adjustable measuring spoon also snaps apart and is dishwasher safe, so clean up is easy. Great for cooking and baking, it even has a magnet on the back for hanging. 5 year warranty. 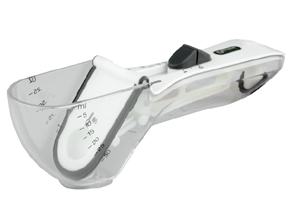 Looking for an adjustable measuring cup? Then click here for the original NuScup. Fast, accurate and easy. Winner of the 2005 Retailers' Choice Award, this innovative measuring spoon features a translucent scoop so you can see exactly what is being measured and ensure accuracy. The NuScup Mini has markings for both metric and imperial measurements. The scale on the handle shows teaspoons and tablespoons, and on the sides of the scoop there are marks for ml and ounces. The comfortable rubber knob adjusts easily to measure different amounts. Since there is only the one scoop it takes up little room in your drawer unlike bulky spoon sets. Hang it on the fridge or utensil rack to save even more space thanks to the integrated magnet on the bottom. Swiss made for increased durability and quality. Order Yours Today! Dimensions 6.3" x 1.4" x 1.8 "
Capacity 1/8 tsp. to 2 tbsp. NuScup Mini Adjustable Measuring Spoon - Easy, convenient and less messy. Use this great adjustable measuring spoon for wet or dry ingredients. Superior materials and design ensure easy and effective operation. Make cooking and baking easy with this great kitchen gadget.